Leslie Welch was known as ‘The Memory Man’. He was the star of eight Royal Command performances, 4,000 radio appearances, 500 television shows and 12 films for Twentieth Century Fox. Yet, one day in 1963, he suddenly stepped out of the limelight and into obscurity. Millions tuned in their radios during the fifties to listen to the warm Cockney tones of the Memory Man, as he correctly answered every question put to him on any one of 37 sports. Asked who won the Derby in 1900 he would stand in thought for a few moments as if scanning the pages of the morning paper, and then answer, ‘Golden Jubilee ridden by Herbert Jones’, and then the weight, and the owner – and then the names of all the other runners and riders as a bonus. Leslie Welch was born in 1907 in Edmonton, North London, where he went to school at Latimers. Although he excelled at exams, his first love was always sport. While his classmates were huddled over a copy of Comic Cuts, Leslie was engrossed in Ruffs Guide to the Turf, or Wisden (the cricketers bible). As some of us learn poetry, or lines for the local amateur dramatic society, Leslie Welch learned FA Cup winners, Derby winners and snooker champions, scores, results, names, colours. He loved sport and he learned it all off by heart. After gaining honours in history at school he worked in the accounts department of the Royal Ordnance in Enfield. And there he might have remained, as an anonymous accounts clerk, but for the interruption of the war. His talent for memorising and then being able to recall accurately the smallest of sporting detail, was discovered almost by accident while he was serving with the 8th Army in the Western Desert. He overheard two officers arguing over the result of a football match; Leslie was not only able to settle the dispute but name the two teams as well. As news of his ability spread it was only a short time before he was transferred to ENSA where he was able to put his civilian training in accountancy to good use by doing the performer’s books by day and entertaining the troops on stage by night. Knowledge of his amazing memory came to the attention of everyone from Monty downwards. But it was radio that brought him commercial success. After the war, he gained a regular spot on Kaleidoscope, Variety Playhouse, In Town Tonight and Calling All Forces (later Sportsmen) where he worked alongside stars such as Bob Monkhouse and Ted Ray. (On a personal note I wrote to Bob Monkhouse for permission to use the following and he rang me one Saturday afternoon from his holiday home in Barbados. His act was extraordinary he recalls in his autobiography Crying With Laughter. ‘I remember seeing him on stage, standing as if to attention, with his fingers flickering, perhaps counting off the numbers of the pages. Sometimes he could recall a whole page of Wisden, including information which he didn’t need, like the page number, or notes in the margin’. 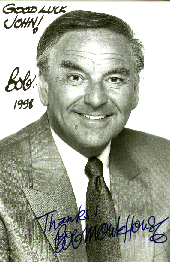 Along with Denis Norden, Bob Monkhouse scripted interviews with sporting celebrities for Ted Ray. When Ted Ray asked Lester Piggott the name of his first winner, Lester replied, ‘Napoleon’. At which Leslie immediately interrupted and corrected the young jockey by naming the horse as Northampton. No matter what the sport, or how obscure the question, Leslie Welch always had the answer. At the height of his career he played the London Palladium, the greatest tribute to any music hall star. There was no other act like his, nor a better known speciality act playing the boards. The continuing demands of fame and increasing number of appearances on radio and television had its effect on his private life. 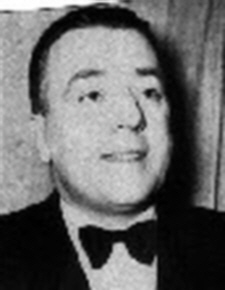 By 1957 he was beginning to miss his wife Kathleen, having already been separated from her for three years by the war.The music hall had replaced the fighting and it was not uncommon for Leslie to return home on the milk train just to be with his wife for a few hours before setting out early next morning for the next engagement. The gruelling Northern club circuit took its toll and, in 1963, Leslie Welch turned his back on the stage and looked for a safe nine to five job. He became a civil servant at the Holloway Road Labour Exchange in North London, where, ironically, the staff recalled him as a rather forgetful man. It seemed that anything outside of sport did not interest him sufficiently enough to warrant remembrance. Although he was beginning once again to accept some bookings for Masonic lodges, rotary clubs and company dinners, he retired from the civil service in 1972 and settled in Ruislip, Middlesex. On February 8, 1980 he collapsed and died a few yards from his home. Despite his fame and his status as a household name during the 1940s and 195Os, Leslie Welch never considered himself special. He once said: ‘It is my belief that everyone is born with a perfect memory, but by the time they are 21, thanks to the invention of pen and paper, they are only using a fifth of it. The other four-fifths has gone dormant like a muscle not being used’. In this age of computer databases and memory phones, Leslie Welch’s memory act would have been even more outstanding. He read the sporting pages of the press until he died proving, if only to himself, that his memory was functioning as well as ever. Most sporting memories remain as just print on the page; there will never be another Leslie Welch to breathe life into them. © John Barber – originally published in Yours October 1998. This page and more in a similar vein comes from a collection in my eBook. An echo from the Green Fields . A selection of pages featured in the book can be read by following the links in the right hand sidebar; all pages are on this site.